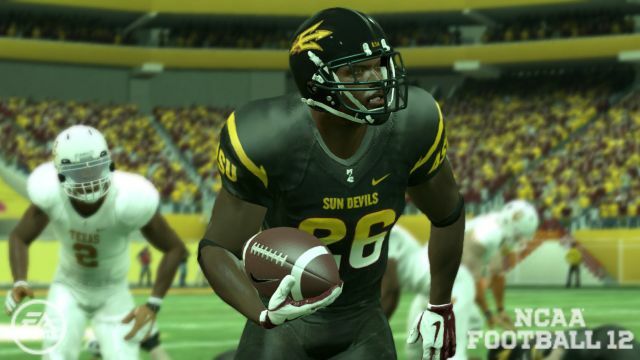 EA SPORTS has posted a new blog detailing Game Update #2 for NCAA Football 12. Title Update #2 Update: We have made it through internal certification and now we're waiting on approval from Sony/Microsoft. The update is hitting a bit later than expected because we addressed a few additional stability issues that will improve the experience. Continue on to see the announced game update contents. Hey everyone, Ben Haumiller here and I’m happy to officially announce the details on the second Title Update for NCAA Football 12. Unfortunately I can’t give an exact release date, but it currently looks like the Title Update will release before the end of this month. We’ll be sure to keep you posted on the Title Update availability here and on our social channels. As a token of our appreciation, we’re happy to announce that as of today “Week Advance Anywhere” on the web is now available for use, and that this feature will be FREE for everyone to use. With this Title Update the missing play issue that led to a number of problems when using Custom Playbooks has been fixed. Not only is the issue fixed, but you will not need to recreate your playbooks! Any existing playbook will have the fix applied, and you will be able to continue using that playbook without issue. As with the Custom Playbooks resolution, the fix to the issue of edited player tendencies changing will not negate any previously edited roster file. The fix will be applied to both those existing files, as well as any new roster file that is created. If you are in a Dynasty or Online Dynasty you will not need to restart as long as your Dynasty is still in year one and you have not advanced past “Training Results” in the off-season. If you are before this point, the update will be applied to your existing Dynasty/Online Dynasty and the tendencies will be correct for all players going forward. If you are in year two and beyond, the tendency issue impact will be less and less as the players graduate/are cut from the rosters. In addition to the tendencies issue, we have also included both the ability to edit height and weight for players, as well as the option to edit the rosters of CPU controlled teams. In an Online Dynasty the commissioner will have the ability to edit the rosters for other human controlled teams. These were both big requests from you in the community. Finally, a bug was fixed with the profanity filter that was preventing many common names from being entered. Now, any name can be entered, for offline use. A profanity filter is applied to Online Dynasty when the Dynasty is created. If you prefer to opt out of this filter, you can set the Dynasty to Private and the profanity check will not run. A major focus for this Title Update was to address any freezes/crashes that were found. There were a number of these issues fixed in this Title Update including a crash that occurred when there were multiple TeamBuilder teams in an Online Dynasty, as well as a crash that occurred during the downloading of an Online Dynasty file. Increased the acceleration of QB’s on Speed Option plays. Fixed an issue where defenders assigned to play the curl to flat/buzz zone did not engage immediately when the QB scrambles past the LOS. Fixed an issue where safeties with inside deep ¼ zone would drop back instead of read-and-react on run plays. Fixed an issue in Nickel Cover 3 where the flat zone defender didn’t move as the QB was running at them. Fixed an issue with Double Outs from 4-2-5 Normal where the RLB wasn’t blocked properly vs. certain formations. Fixed an issue that caused a blank photo to be uploaded leading to issues with other highlights being uploaded. Fixed an issue in Online Dynasty where injured players did not remain injured when the week advanced. Fixed an issue where a player’s injury time was only reduced by one week when going from Conference Championship week to Bowl Season. Players will now be back for their Bowl game if they should be off of the IR when their bowl game is played. Fixed an issue where coaches that changed jobs could get stuck in a state where they were still listed as coaching at their old school on the Players Leaving screen, leading to a Transfer Failed issue. Fixed an issue that occasionally prevented Dynasties from advancing to the post season. Fixed an issue with the schedule that prevented entering the Virginia Tech vs. Boston College game (fixed for both Dynasty and RTG). Fixed an issue where recruiting related trophies/achievements were not unlocked properly if you signed an extension in that season. Fixed an issue with Program Stability where the grade would drop from A+ to D+ in one season. Fixed an issue with the Unlock All Promises PDLC not unlocking properly on the Dynasty website. When viewing an Online Dynasty invite, added information to show what type of job can be selected by default. Fixed an issue when in the off-season where player stats did not match up between the web and console. Fixed an issue where CB’s could not audible after earning the ability to do so through Coach Trust. Fixed an issue where HB’s could not flip the play after earning the ability to do so through Coach Trust. Fixed an issue where player’s online stats were not displaying promptly on the Online Leaderboards. That concludes the list of updates that will be included in the second Title Update. Once again, thank you for your continued support, as well as your willingness to help make NCAA Football 12 the best it can be. LOTS of good stuff here. a lot of changes here, which is good. I like the fact that it should be released soon, our patience has been rewarded. Yep...especially with the advance the OD from the web for FREE when it was going to cost originally. Diving catches? All those cool diving catches are not in the game. I have yet to see a single diving catch. in regards to what griffin and sinister posted, those would fall under the "Tuner Update" category, stuff like that doesn't get patched, rather tuned, which serves the online guys very well. Agreed, LOTS of good stuff there, particularly defenders reacting to the QB running instead of building anther S'more on their assigned zone campfire. Only diving animation I've seen is the half-dive catch into a roll thing. Looks pretty good. Looking forward to better option execution. I agree with these among other little things that annoy some. They seem to have fixed MAJOR things with this update, forgot about the other little things that must be corrected. I actually saw my first one in my latest CC game. Video will be uploaded shortly. Temple vs. Miami (OH). From what I've noticed is that those tuners are only dropped with patches so it really doesn't 'help' us too much. Maybe I misunderstood the concept of them but NCAA isn't tuned as much as I envisioned it (at least twice monthly if necessary). So you actually seen one of the new diving catch animations? Was the wr a highly rated wr? I have played a ton of games and my best wr that I have had in my dynasty was 94 and never did the animation trigger. Fixes to the freezes and crashes and I'm happy. The ability to advance Online Dynasties via the web is live NOW. If the rolling dive animation is one of the new ones and I don't recall seeing it prior to '12, then yes, I've seen it at least twice......both times with the same WR I think on long passes that he caught going into the endzone. It is one where he catches it and then kind of rolls to cushion his fall. I've sent a tweet to CM Justin Dewiel and Development Director Jason French to see if they can let us know if a Live Tuning Package will be accompanying the patch. Last year, I think each patch had one so I am assuming there will be, but want confirmation either way. "Before the end of the month?" Seriously? That's what? Six, seven weeks after launch? I'll be sick of NCAA 12 by then, and I haven't even been able to use the #1 feature: custom playbooks.